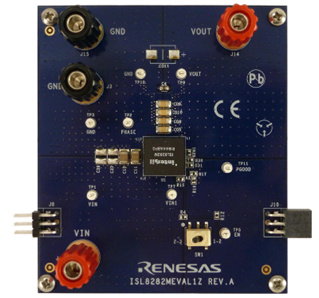 The ISL8282M is a PMBus enabled DC/DC singlechannel step-down power supply featuring theproprietary Renesas R4™ Technology. 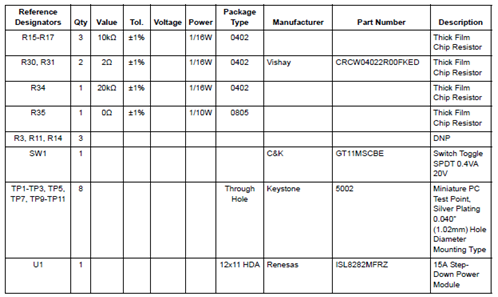 The modulesupports a wide 4.5V to 16.5V input voltage range and awide 0.5V to 5V output range capable of delivering up to15A of continuous current. The ISL8282M achieves upto 95% conversion efficiency and is optimized for highpower density. 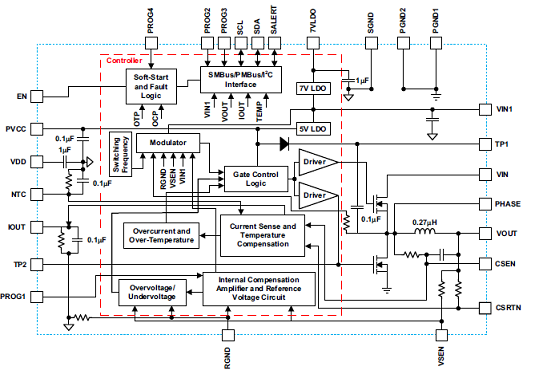 Integrated LDOs provide module biasvoltage allowing for single supply operation. TheISL8282M includes a SMBus/PMBus/I2C interface fordevice configuration, telemetry (VIN, VOUT, IOUT, andtemperature), and fault reporting. 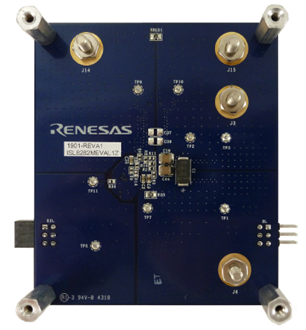 The proprietary Renesas R4 control scheme has extremelyfast transient performance, accurately regulatedfrequency control, and all internal compensation. Anefficiency enhancing PFM mode greatly improveslight-load efficiency. The ISL8282M’s serial bus allowsfor easy R4 loop optimization that results in fast transientperformance across a wide range of applicationsincluding all ceramic output filters. The ISL8282M has four 8-bit configuration pins thatprovide very flexible configuration options (such asfrequency, VOUT, and AV gain) without the need forbuilt-in NVM memory. 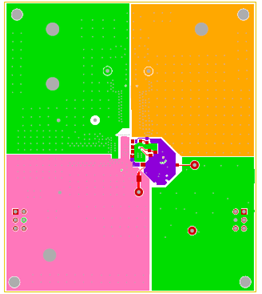 As a result, the design flowclosely matches traditional analog modules while stilloffering the design flexibility and feature set of a digitalSMBus/PMBus/I2C interface. The ISL8282M featuresremote voltage sensing, completely eliminates anypotential difference between remote and local ground,and improves regulation and protection accuracy. Aprecision enable input coordinates the startup of theISL8282M with other voltage rails and is especiallyuseful for power sequencing. 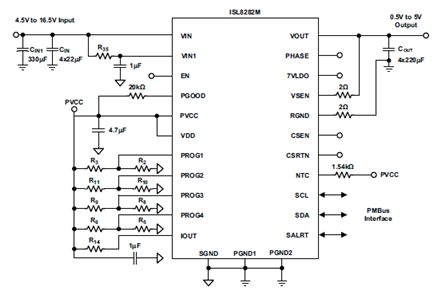 The ISL8282M integrates all power and most passivecomponents to minimize the external components andsignificantly reduce design complexity and board space. The ISL8282M is available in a low-profile, thermallyenhanced, compact 12mmx11mmx5.3mm fullyencapsulated HDA package. 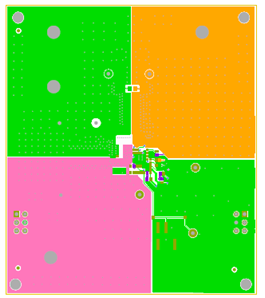 The ISL8282MEVAL1Z evaluation board (shown in Figures 4 and 5) is designed for evaluating the ISL8282M. TheISL8282M is a single channel step-down, synchronous DC/DC power supply module that is capable of delivering upto 15A of continuous current. 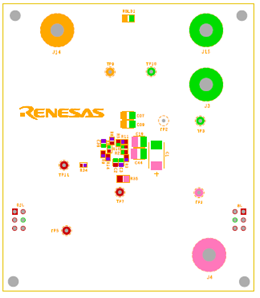 The proprietary RenesasR4 Technology control scheme has extremely fast transientperformance, accurately regulated frequency control, and all internal compensation. The ISL8282M includes anSMBus/PMBus/I2C interface for module configuration, telemetry (VIN, VOUT, IOUT, and temperature) and faultreporting, and allows for easy R4 loop optimization that results in fast transient performance across a wide range ofapplications, which includes all ceramic output filters. 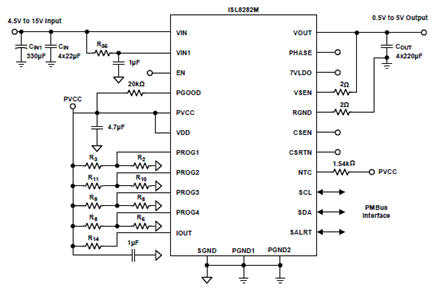 The ISL8282M integrates the controller, all power components,and most passive components. 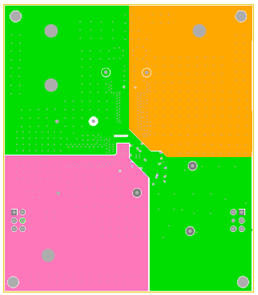 The device requires only a few external components to operate, which significantlyreduces design complexity and board space, and it optimizes for high power density applications without the need forairflow or a heatsink. 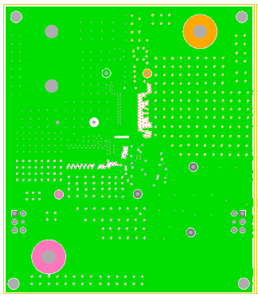 The ISL8282MEVAL1Z evaluation board is a 3x3.4 inch six-layer FR4 board with 2oz. copper on all layers. TheISL8282MEVAL1Z operates from a single 4.5V to 15V wide input power rail and offers adjustable output voltagesdown to 0.5V and efficiencies of up to 95%. 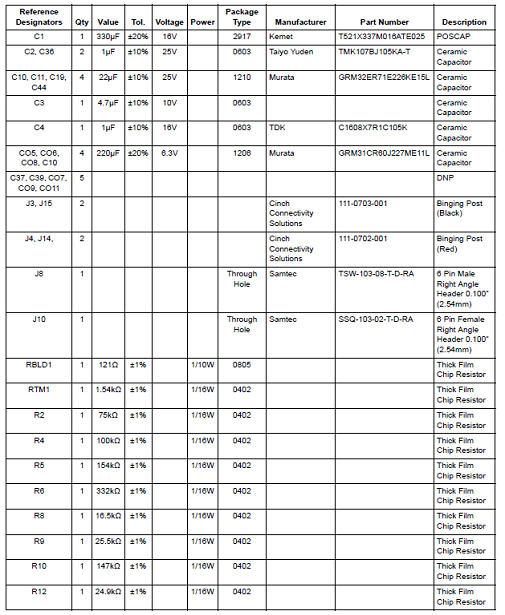 The ISL8282MEVAL1Z comes with placeholders for pin-strap resistors toprogram output voltage, PFM/PWM mode, temperature compensation (TCOMP), PMBus address, switchingfrequency (fSW), AV gain, OCP retry/latchoff, ultrasonic PFM enable, soft-start ramp rate, RR impedance, and AV gainmultiplier (1x or 2x). 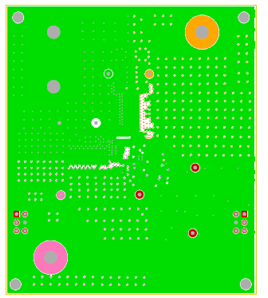 The ISL8282MEVALZ ships with the ZLUSBEVAL3Z (USB to PMBus adapter), which connects the evaluation boardto a PC to activate the PMBus communication interface. 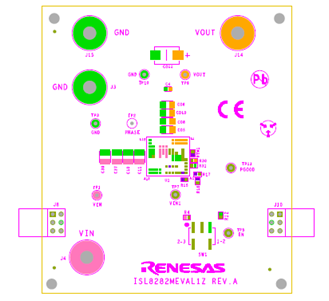 The PMBus command set is accessed by using the RenesasPowerNavigator™ evaluation software from a PC running Microsoft Windows. 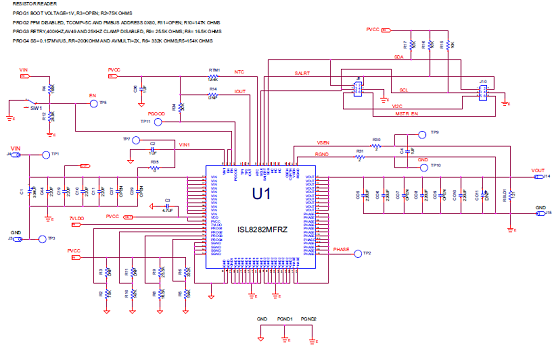 The ISL8282MEVAL1Z can operatein Pin-Strap mode without needing the ZLUSBEVAL3Z adapter or PMBus communication. By default, the ISL8282MEVAL1Z is set to a 1V output voltage with a 400kHz switching frequency, 49 AV gain, and200kΩ RR.